This weekend, at least 300,000 people paid Steve Jobs hundreds of dollars to become a beta tester for the first iteration of Apple's highly-anticipated tablet. In case you missed it, the iPad came out Saturday, April 3rd - to the delight of Mac devotees everywhere. Reviews were largely positive for the device, though there were dissenters - as is to be expected for a product like this. But how has the public received it? Pretty well, according to the House of Jobs. Apple figures indicate that the portable touch-screen computer had shipped 300,000 copies by midnight on the 3rd. On that first day, those 300,000 users downloaded over 1 million apps and purchased 250,000 ebooks from the iBookstore. 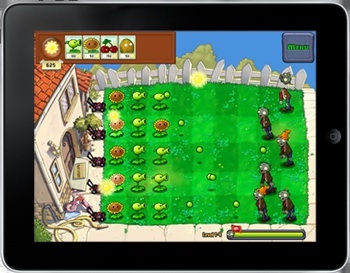 According to Lazard Capital Markets analyst Colin Sebastian, 30% of the roughly 3,300 day-one iPad Apps were games, as were four out of the ten top-grossing apps including Firemint's Real Racing HD, EA's Scrabble, and PopCap's Plants Vs. Zombies. Seeing PvZ on there makes me happier than it should, really. "It feels great to have the iPad launched into the world - it's going to be a game changer," said Apple Overlord, His Grand Eminent Excellency Steve Jobs. "iPad users, on average, downloaded more than three apps and close to one book within hours of unpacking their new iPad." At first glance, I'll admit that 300,000 sounded kind of low to me - after all, I'm used to sales of videogames, where the big blockbusters can ship multiple millions in the first day alone. But, I then reasoned, games are quite a bit cheaper than iPads - how does this compare to the previous major Apple launch, the iPhone? A brief look at Wikipedia (which as we all know is never, ever wrong) says that analysts estimated that the iPhone sold between 250,000 and 700,000 units its first weekend, which is a pretty vague range. The only concrete number comes from service provider AT&T, which reported that 146,000 iPhones had been activated that first weekend, which does not include any units that had been purchased for resale or simply hadn't been activated right away. However, it seems unlikely to think that half of all iPhones sold in the initial weekend were bought for the sole purpose of being resold on eBay - or were late being activated - so we can probably assume that iPhone didn't sell 300,000 units at launch. Which means that the iPad is currently on track to outpace the iPhone. Go figure.